PLEASE POST PICTURES and keep links to a minimum. bravo, very nice indeed, I'll be doing some CSA soon, whats your recipe for the butternut brown and the greys, you have there. There is no "mix" per say, more just a method. All my base coating now is done with an airbrush and only the detail with a brush. All the figures are undercoated with grey "super etch" primer spray pack. The they are pre-shaded with Vallejo Model Air "Panzer Grey". For Butternut they are then given a coat of "Cam. Medium Brown" (dark) or "Mud Brown" (light) allowing the preshaded areas to show through. Then the paint remaining in the airbrush is thinned with white to about a 50-50 mix. The figure gets another coat but focused on the upper areas of the figure or those that would be exposed to more light. The remaing paint again has white added, about as much as there is in the airbrush making it about a 25-75 mix of brown to white, then another coat narrowing the focus to the areas that really need to be highlighted. The Greys use the same process but start with "Light Grey", "Medium Sea Grey" or "Barley Grey". All paints are from the Vallejo Air range. 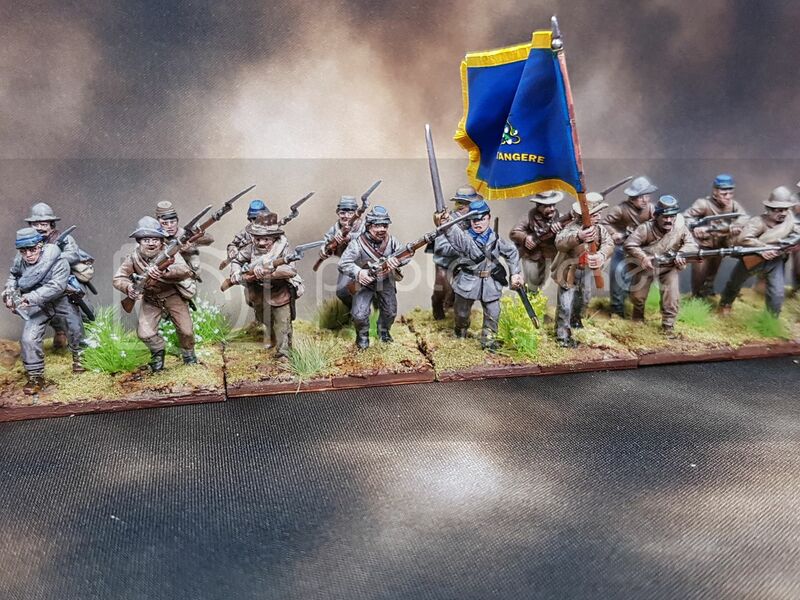 I would love to take credit for the flags but they are ones I bought from "Flags of War". 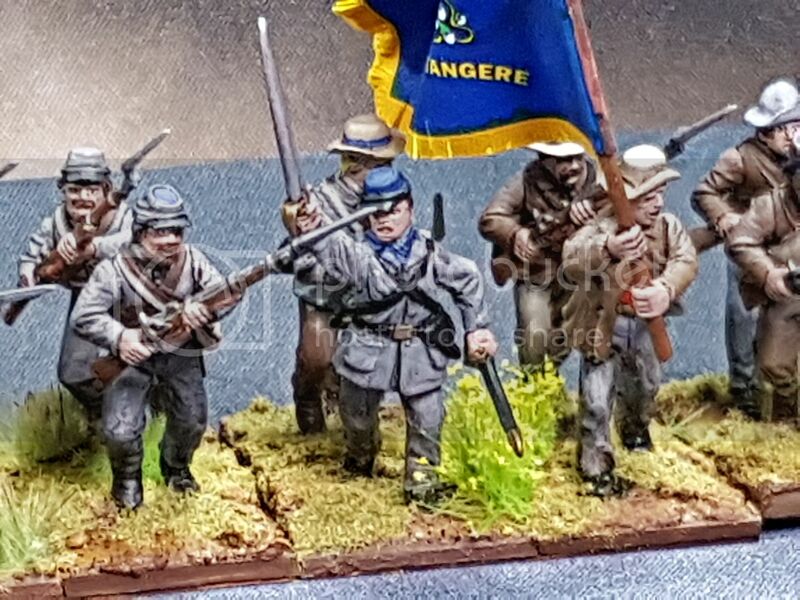 As I am only making one standard bearer per regiment I have used the State flag that comes in each pack rather than the Union or Confederate flag that comes in the packs as well. The 18th here actually came with their divisional flag (white circle on blue background wih regimental number written in the circle) as well as their State flag. Looking forward to seeing them grace a table top! I can't wait to get them on the table either. 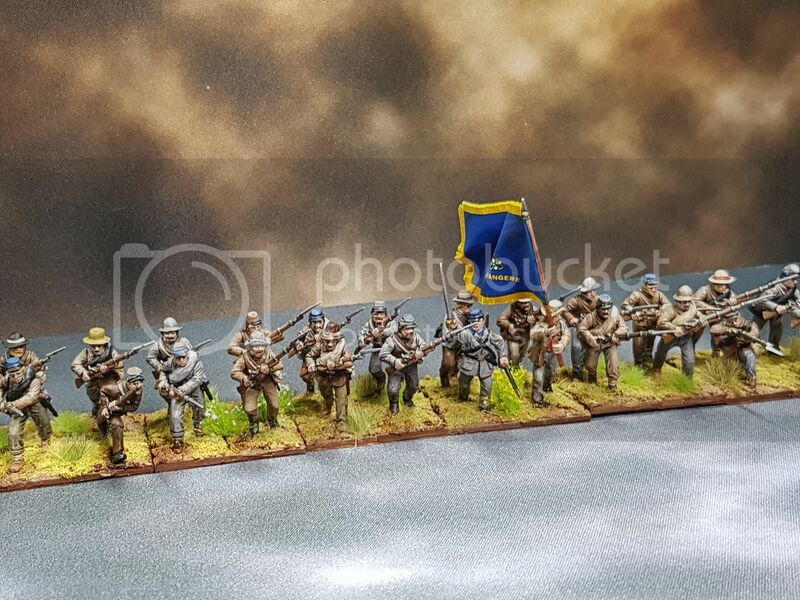 Does the airbrush speed up the painting process? 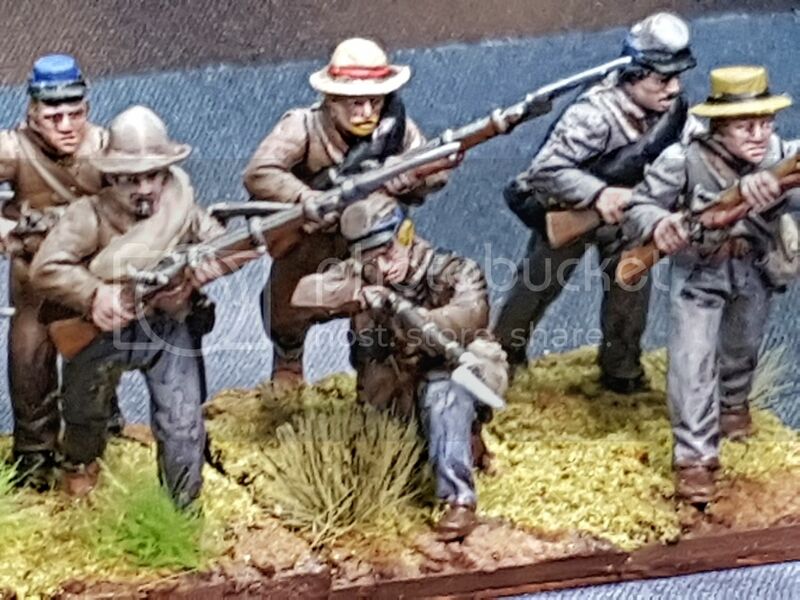 Massively.I am still learning really but I reckon I'd have to 5 or 6 times faster getting base coating done and am getting better shading on the figures to boot. The tones are often very subtle but I reckon the difference is noticable. 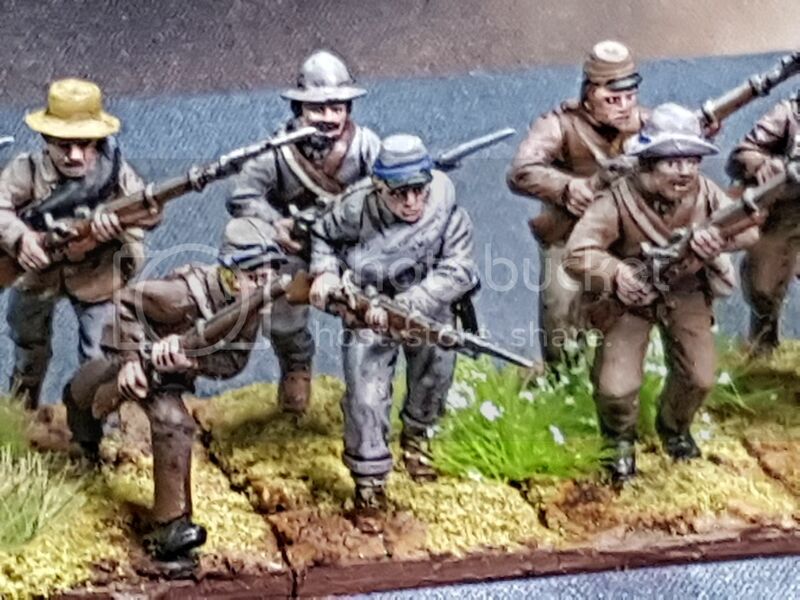 Got to do some Confederate cavalry soon so to give you an idea I do before and after photos with the stop watch running and you can be the judge.